I don’t how much of an anomaly this might be, but it seems there have been an awful lot of fires striking Amish businesses lately. A state police fire marshal estimated the damage at $50,000 and reported that no one was injured. The owner, who is Amish, had no electric service to the shop and had left the woodburning stove cold, said state Trooper Russell Stewart, a fire investigator based at Troop D in Ridgeway. In many cases of Amish fires, the source of the flame is the lighting or heating used by Amish, which can be natural gas, kerosene, or other fossil fuels. In this case it looks like that can be ruled out. “Arson” gives this case a much darker tone. No word on suspects yet. The entire building, in a 40-by-80-foot frame, Stenman estimated, was ablaze as the first firetrucks arrived and with its fate apparent, the owner asked firefighters to turn off their hoses. I would assume that was the motivation for the Amish in the Spring Mills case to not call the fire department either. Maybe it seems counterintuitive, but at a certain point, it’s easier to just let the fire finish what it started and start from scratch. Bad luck, more reporting, or something else? I don’t keep any statistics, but this seems like a lot of fires. In addition to these four fires in a roughly two-week span, we have seen at least three significant Amish house fires since late autumn, dating back to the tragic Thanksgiving Eve fire in Geauga County, Ohio. 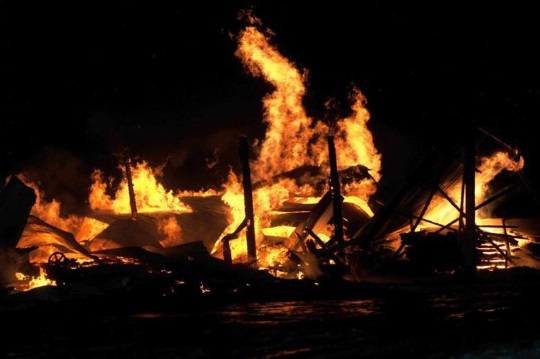 An Amish barn also burned down January 29th in St. Croix County, Wisconsin, after the owner’s attempt at boiling water went wrong. And another Amish workshop burned December 27th in Hammond, New York, with the blaze caused by a motor. Maybe fires in Amish structures happen at this frequency normally, and for some reason, are just being reported more lately. Or I just started noticing them more. Or maybe it’s a spell of bad luck. Typical Amish forms of lighting and heating do generally carry a greater safety risk than conventional lighting and heating. With that in mind, logic would suggest colder months would be a more dangerous time for fires. In any case, I don’t recall ever seeing so many reports of fires hitting the Amish in such a short span of time. In the area I live , Clarke Co Wisconsin, there have been 2 major fires in the last few weeks. 1 being an Amish family (good friends) and an Old Order Mennonite family the next town over. Both were due to Chimney fires and both a total loss.. I so sorry to hear that these people are haveing such bad luck, it does seem to be quite strange for so many fires. i hope all goes well they work so darn hard at what they do . Sorry to hear that Elisabeth, I did not see any mention of those fires in the news, at least not online. I do wonder how many are not reported. So many fires in such a short time is very suspicious to me. Even with wood heating, has this ever happened before??? I truly hope the Amish community is not being targeted for foul play. This makes me very sad. I agree Daneise, only one of these fires has been cited as arson. Building fires leave remnants of ash and memories, both good and bad. What a refreshingly simple solution to allow the fire to finish what it started, and allow for a more easily managed cleanup. A terrible tragedy that carries huge financial burdens. But no injuries nor deaths are truly a priceless outcome. Bless all families involved, and prayers for quick recoveries. Well said Steve. I found the “let it burn” approach sensible. I guess the question is how do you make that judgment call, and have to assume that by letting it burn you’re not threatening any other structures or the fire getting further out of hand. I am very sad this is happening to them. I pray they are not being targeted. That would be absolutely horrible. Grudges get settled one way or another. I know one family who lost a barn to resentment — young people who hadn’t yet joined the church, who didn’t appreciate their parents learning about what they’d been up to, who thought about the tattletale, We’ll show HIM. Then the young’uns had to boast, We showed HIM. The law never got involved but reparation was made. There was an infamous case in 1992 in the Big Valley of a 23-year-old grandson of an Amish bishop setting a series of barn fires. The man’s father was also a convicted arsonist who burnt down his employer’s barn in 1965. Neither of those were members of the Amish church however. The weather has been very cold the last 2 weeks in the north. The temperature in my car on January 31st was -26 Fahrenheit. The wind chill was in the 40-50 below range. I live in Kenosha County Wisconsin. They probably over packed the wood stoves. It only takes one errant spark to start a fire. Interesting point. Maybe that’s what “wood stove failure” is referring to in the fourth incident above. There was an Amish Fire in our area several years ago that seemed to start from Kids smoking. It was brushed off as the whole community comes together to help them rebuild. It seems the community pays for the rebuild, not the family that had the loss. Correct me if I am wrong. It seems the hatred for many things has risen since the current administration took over the country. I am afraid we will continue to see what we are seeing and much worse before this is all over. I will pray for those families. Patti, I could not agree more. The past few years have brought back some bad elements of our society I hoped had been laid to rest. At age 65, I’ve seen enough prejudice and intolerance to last me several lifetimes. Immorality, shamelessness, and lack of empathy for others have become the new norm. I pray, soon, this disease will subside as quickly as it has surfaced. Steve, I totally agree. I am the same age as you, and I thought in our lifetime things would continue to improve. The last 2 years has seen a rapid decline. The lack of empathy for others, lack of common sense, lack of work ethic is appalling. It is one of the reasons I enjoy reading about the Amish as the sense of community, old ways, common sense…willingness to help others goes above and beyond. I pray it also subsides. We follow the “SPICES”. (We also have a Nobel Peace Prize).